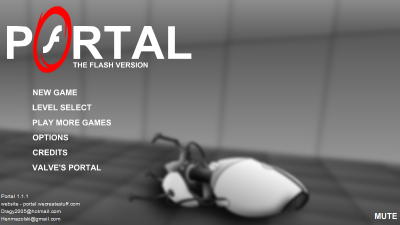 Portal: The Flash Version is a two dimensional game made with Adobe Flash based on Valve's Portal. It features the same environment and testing elements as Portal does, while even introducing some new features of its own. This game has also been recreated into the Portal Software Development Kit (Source SDK) and released as a Map-Pack. Some of the levels are included in the XBOX Live Arcade version of Portal, Portal: Still Alive. Some of the levels and mechanics used in this mod have also been "borrowed" over into a few other Map-Packs, or "Mods". This can most commonly be found in the Portal: Prelude mod, which uses the Electricity Field and a few of the levels used in the flash version. The game starts with the words "Good morning subject 15837. It is time to begin your test." after which the first "task" (which is what the game familiarizes the test chambers as) starts with the use of the ASHPD or Portal Gun. The text on top of the screen suggests that the subject might not be familiar with the facility, but explains that they need to exit the rooms. The first task where the player can be killed in is Task: 10, where a ledge the player needs to Portal over is introduced. The first encounter with a dangerous mechanic happens in Task: 11, with a modified "Crusher" used in the trailer for Portal. Most of these tasks do not require precise timing, except for a few tasks featuring the High Energy Pellet (known as Combine Balls in the Half-Life Universe) or the dangerous "Electricity Field", that lights up for four seconds at a time and then pauses for three seconds. The game uses most of the mechanics that are used in the original Portal, but it also uses some scrapped and totally new mechanics as well. Here is a list of the mechanics that weren't used in the original Portal but made it to Portal 2 from the flash version. Portal: Still Alive, being largely based off of the MapPack and thus the Flash Version, includes all of the features introduced in those titles. Screenshot of task #01, "Meet the ASHPD." Screenshot of task #04, "Portal-Proof walls." Screenshot of task #06, "ASHPD+Momentum." Screenshot of task #10, "You are not invincible." Screenshot of task #16, "Anti-Object." Screenshot of task #19, "Red Buttons." Screenshot of task #21, "Energy Balls." Screenshot of task #25, "Cubes." Screenshot of task #29, "They can shoot you." Screenshot of task #33, "Think with portals." In task 16 as you are passing the first Blue plasma wall, a character carrying a briefcase (presumably the G-Man from the Half-Life series) can be seen walking behind the window. This page was last modified on 20 September 2018, at 00:44.